Victory in the titanic final confirmed the All Blacks’ place in history as the greatest team of all time as they became the first nation to defend the title and the first to lift the Webb Ellis Cup three times, running out 34-17 winners at Twickenham on Saturday. McCaw described the win as the proudest moment of his career, which is expected to end with his memorable 147th Test appearance. “We said four years ago after the last one that we’ll get on the road again and with this being the end goal, playing at Twickenham in a World Cup final to try and do something no one else has done,” he said. “I’m so proud of the way the guys have done that today. We played some damn good rugby there. The All Blacks’ victory completed four years of utter dominance in which they lost just three of 54 Tests since their drought-breaking World Cup win on home soil in 2011. 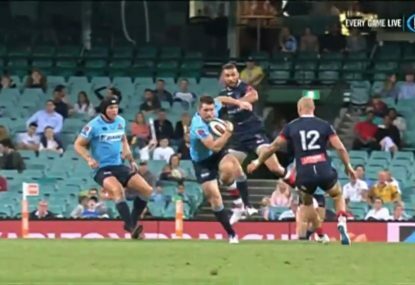 But they were forced to repel a Kurtley Beale-inspired fightback as Michael Cheika’s men again showed their incredible resilience to pull within four points through tries to David Pocock and Tevita Kuridrani after trailing 21-3 shortly after halftime. Underdogs to start the match, Australia’s hopes were dealt a savage blow with first-half injuries to key men Kane Douglas (knee) and centre Matt Giteau (concussion) and their chances of victory shrunk further when they took a 16-3 deficit into halftime. But Wallabies captain Stephen Moore refused to pin the loss on the costly injuries. “No excuses from us tonight. That’s a World Cup final. You deal with that stuff,” he said. “What I am proud of is the effort we showed right through the 80 minutes. “Sometimes you come up against the better team and that was us tonight. It was the biggest halftime lead in a World Cup final and no team had overturned a halftime deficit to win in seven previous finals. But the scoreline accurately reflected New Zealand’s incredible first-half dominance, in which they had 71 per cent of possession and 79 per cent of territory. Ultimately, this was one mountain the Wallabies couldn’t climb – and the result appeared to be assured two minutes after the break when Ma’a Nonu scored a magnificent try. 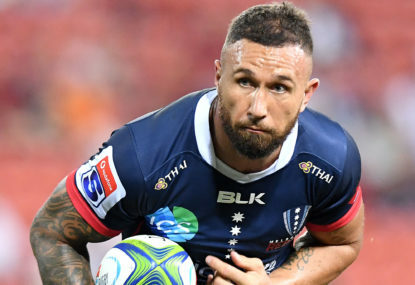 The hard-running centre, also playing his last Test, latched onto a sublime Sonny Bill Williams offload to burst through the heart of the Wallabies’ defence on a blistering 45-metre run before wrong-footing Beale and extending the lead to 21-3. 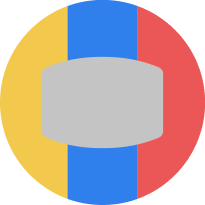 However, the match turned on its head with a 52nd-minute sin-binning of All Blacks fullback Ben Smith for a tip tackle on winger Drew Mitchell as he became the first player yellow-carded in a final. It was Australia’s first entry inside the All Blacks’ 22, and they capitalised instantly – with Pocock finishing off a rolling maul to reduce the deficit to 11 points. 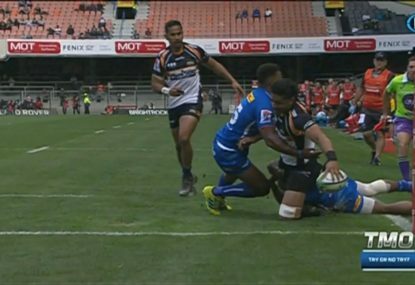 Kuridrani crashed over nine minutes later, cashing in on a clever box kick by Will Genia that was regathered and offloaded by Bernard Foley. 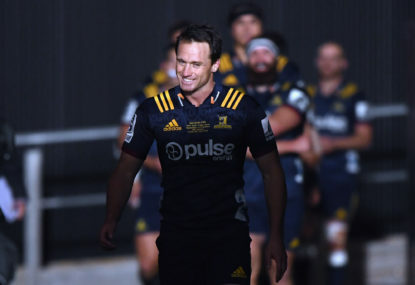 The comeback was snuffed out by man-of-the-match Carter, who slotted a drop goal 10 minutes from time that extended the All Blacks’ lead to seven, while a further penalty five minutes later sealed the result. “I knew the momentum was against us but we’ve been in those situations before,” Mccaw said. “It’s a manner of not panicking and doing the simple things to get the ball back and get back in control. Every man did that again today. 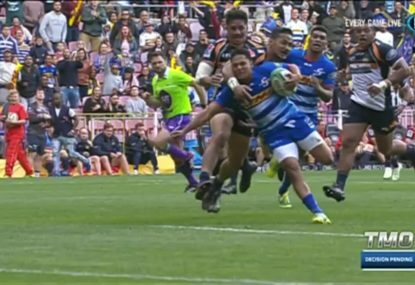 Replacement five-eighth Beauden Barrett put the icing on the cake with a 79th-minute runaway try. Australia’s ill discipline had again cost them dearly, with Carter nailing three first-half penalties before Milner-Skudder finished off a beautifully constructed play to cross the tryline in the final minute of the first half. Carter finished with 19 points from two conversions, four penalties and a drop goal. 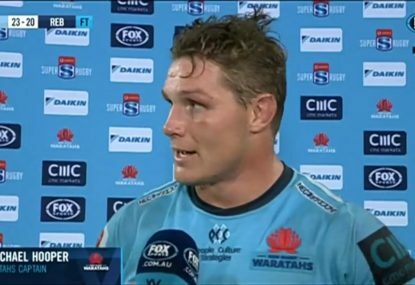 The Waratahs habe defeated the Melbourne Rebels 23-20 in Michael Hooper’s 100th match for New South Wales.